On a dusty street of a village in the North West Province a group of 12-year-olds are cheering each other on as they play kgati, an indigenous game using a skipping rope. As the game intensifies one of them hears her grandmother shouting from the kitchen, requesting her to go to their ward counsellor’s house and ask if social grants will be paid the following day. Relying on others for social service information is the reality faced by many South Africans. The North-West University (NWU) has launched a ground breaking eDirectory system called Yabelana which will connect older adults with the future of communication. Yabelana – which means to share – is the first information sharing system of its kind in the country. It provides older adults and those living with them with location-specific information ranging from health care, social services, ward councillors’ contact details and events which can be accessed through Information Communication Technologies. All the information can be accessed on pushbutton phones with the *134*237# USSD code and on smartphones by downloading the Yabelana App on Google Play Store or Apple iStore. The app is a product of the we-DELIVER project led by Prof Vera Roos and hosted by the Optentia research focus area on the campus in Vanderbijlpark. It was formally launched on September 26 2018 when it was presented to senior citizens from the Sharpeville Centre of the Aged. According to Prof Roos, Yabelana utilises community involvement to continuously add service providers. “Service providers are registered on the app to create and update their information and to send push notifications of events and services to service recipients who can also give feedback on service delivery. Yabelana promotes citizen participation and accountable service delivery,” she adds. 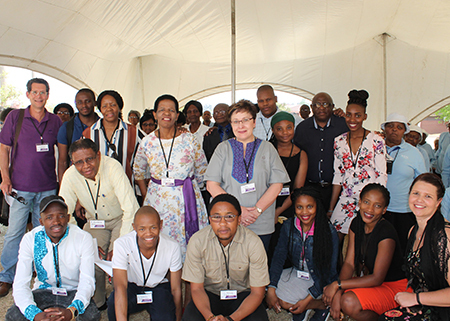 From January 2017, 24 students and staff from various departments and entities on the three NWU campuses joined forces to work on the we-DELIVER project. “Population ageing is a reality, and it is predicted that in 2050 there will be more people over the age of 60 years than children who are 15 years and younger. The growing number of older adults and their accompanying care needs pose real-life challenges to service delivery with already limited resources especially in rural areas,” says Prof Roos. She says the we-DELIVER project was informed by the observation that there is no centralised information system for older adults about services available in their communities. However, being mindful that service delivery is not age restricted, categories relevant for people of all ages were included and can be added in Yabelana to promote an age-friendly society. With about 80% of people in the pilot communities of Lokaleng and Ikageng in the North West and Sharpeville in Gauteng using cell phones, Prof Roos and her team concluded that cell phones would be a suitable and flexible avenue to list and share information about services. Quantitative and qualitative methods were used to collect data from older residents in the pilot communities about their phone use, basic and municipal service needs and how they obtain information and services. Findings indicated that a substantial number of older adults, more than 90%, own or have access to cell phones. Their cell phone use is limited to basic cell phone functionalities due to limited knowledge, skills and sometimes a negative attitude. However, during the implementation phase of Yabelana, older adults demonstrated a keen interest to learn how to use their cell phones and reported that their mastery of Yabelana promoted their sense of agency. In the near future Prof Roos and her team plan to implement Yabelana on a national level in collaboration with the South African Local Government Association and Nelson Mandela University’s Digital Communities. Through their work, Prof Roos and her team are ensuring that age will not be a barrier to accessing information essential to their daily lives. This is the team that is responsible for the we-DELIVER project.